In our Catholic homeschool, we LOVE learning about our Catholic saints. We read picture books, watch movies, and even plan special meals to celebrate our favorite saints. For the summer, I wanted to start a new tradition. I’m going to start a morning time, where all of my littles come together to start the day. We’ll read some poetry, a Bible story, and learn about a saint. Instead of reading about a different saint each day, I want to take a slower approach and dive in a little deeper. Starting over the summer, we will examine two saints per month. We’re kicking off June with Saint Kateri Tekawitha and Saint John the Baptist! Are you ready to study Catholic saints in your home with your children, in your homeschool co-op, religious education classes, or even a school classroom? 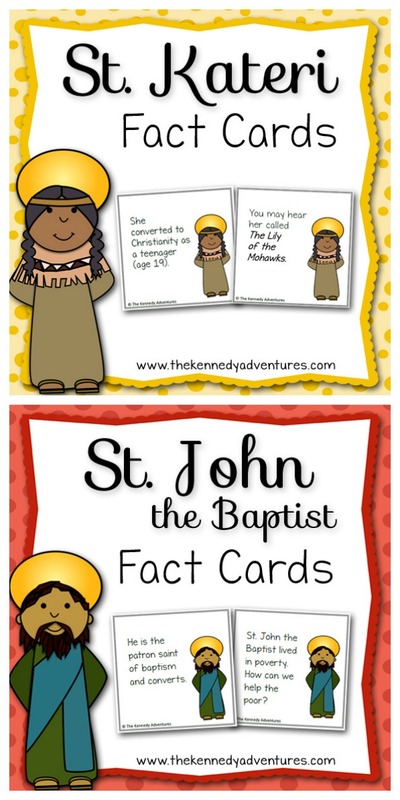 These Saint Fun Fact Cards are an easy, colorful and FUN way to learn about your favorite saint. You can start your mornings with these 30 fact cards that explore amazing fun facts about a Catholic saint. Two saints will be introduced each month. Take a look at the Saint Fun Fact cards for June and grab a copy for yourself! How would you use these Saint Fun Fact Cards in your Catholic home? Have a favorite saint you want us to explore? I’d love to hear your thoughts! These are wonderful! I love how accessible this makes saints for children.